NALP's bimodal salary curve has clearly illustrated the earnings gap between law graduates who take a job in a large law firm and graduates who take a job in just about any other sector or in small firms. (See www.nalp.org/class_of_2013_bimodal_salary_curve.) As has also been documented, salaries have not always had this distribution (see, for example, www.nalp.org/august2012research), nor was the gap between salaries in private practice as a whole and salaries in other sectors as large. As shown in Table 1 and Figure 1, median salaries have approximately doubled since 1985 across all sectors except private practice, where the overall median has tripled. At the same time, however, prices, as measured by the CPI-U, have also gone up, more than doubling over the same time period. The net result is that salaries for full-time jobs in every sector but private practice have essentially remained flat for almost 30 years when inflation is factored in (see Table 2 and Figure 2). 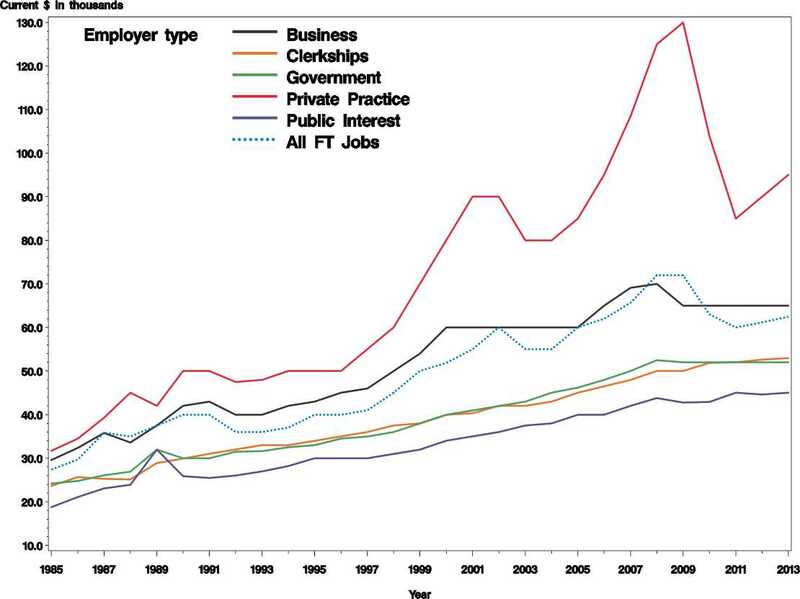 Salary medians nudged up somewhat from about 2000 to 2007, only to fall back again starting in 2008 or 2009, depending on sector. Only private practice has seen real growth of almost 40% since the mid-1980s. At the height of large firm hiring in 2008 and 2009, real growth was about double. So, not only do salaries fall into two quite distinct segments or humps, it is also evident that, on average, many salaries in the left-hand hump offer no more purchasing power than they did in 1985. 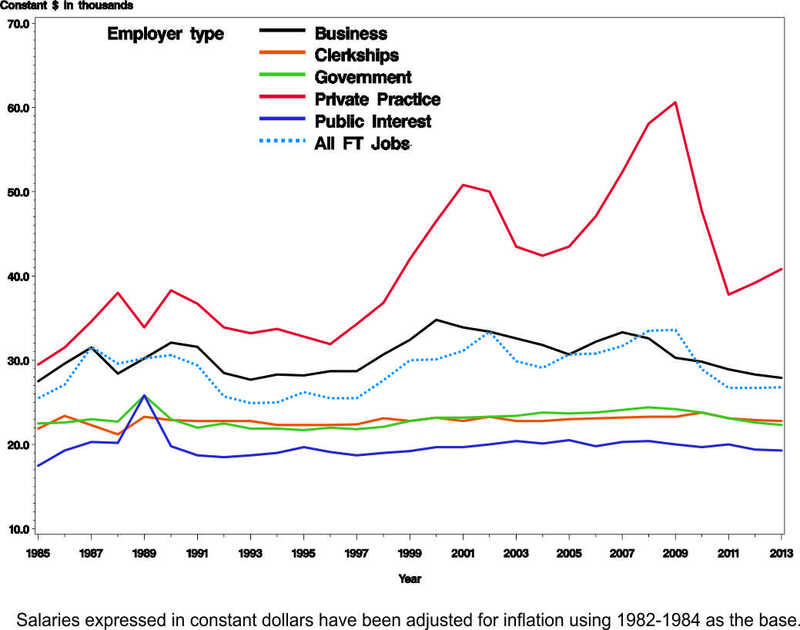 Source: Compiled from NALP graduate employment reports for the law school classes of 1985-2013. Salaries expressed in constant dollars have been adjusted for inflation using the annual average CPI-U as compiled by the U.S. Bureau of Labor Statistics for each of these years. The BLS currently uses 1982-1984 as the base (100) for its CPI figures.